I feel compelled to tell the story of Ricky and the complexities of his mind and life. I look at his photo and cannot believe the depth, darkness, and insights he expressed when only 18 years old. What was ticking behind that great grin? 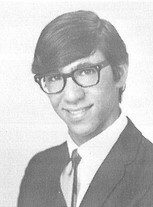 He was my high school boyfriend and we continued to be connected on and off until he committed suicide in a roundabout fashion in 1979. I need to put my thoughts together and dive into what really happened so that I can do Ricky justice.He was such a funny, talented, smart, and athletic soul...but way too sensitive for the challenges of the time. This is a heartfelt opportunity to share our collective memories, and I will return shortly with a real narrative. I just know that if you heard a rumor about Ricky Pobirs dying from a drug overdose it's completely false.